I always love the chance to talk about my office! I work from home in a tiny room that’s tucked away in our house. 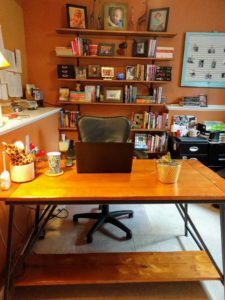 It’s the perfect office for me, because I can be home (which is my favorite place in the world) but I’m also removed from the noise and mess of daily life. About five years ago, I asked for exciting things like a can of paint, shelves, and a roll of cork for my birthday. 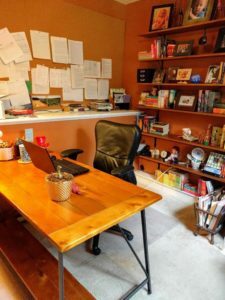 My husband was amazing about getting it all installed for me, and the result is an office that inspires me and creates a great place for me to do creative work. 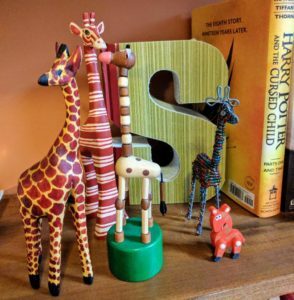 One unique thing about my office is my collection of giraffes. I currently have twelve, and here’s one collection of them. I’ve been collecting them for almost 15 years now, but I don’t really remember why or how it started. My office is also full of reminders of lessons I’ve learned and don’t want to forget. 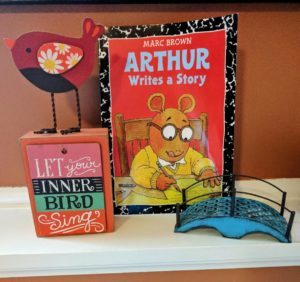 Arthur Writes A Story lives on my office shelf to remind me about telling stories that are important to me in a way that’s true to who I am. The bridge reminds me that my job is to tell the truth. And the bird comes from a time when I doubted the importance of creating art, and it was while listening to some birds sing outside my office window that I was reminded how beauty and purpose can work together. 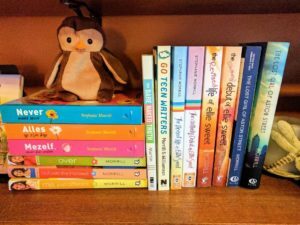 And then I also have a special spot on my shelf for every edition of every book I’ve written, including the Dutch translations of The Reinvention of Skylar Hoyt series, and a nonfiction book I contributed to, The Bare Naked Truth by Bekah Hamrick Martin. Sounds like a suspenseful read. Usually not my genre but this has me interested. Thanks for the giveaway. I’m not on FB soo I’ll say thank you here for the giveaway. Love your office. 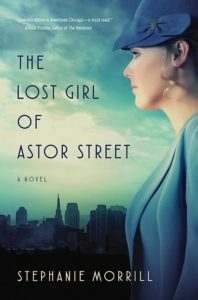 THE LOST GIRL OF ASTOR STREET sounds like it will be a good read. I wish I were still a children’s librarian. 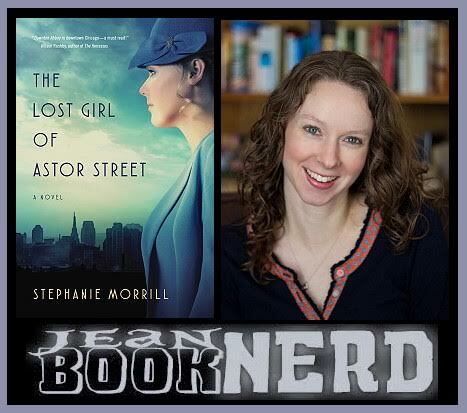 This is a book I would read and likely be recommending to the teens. 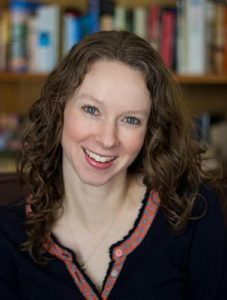 There were also a group of adults that enjoyed the young adult books that were coming out. I do miss the days of keeping up with the good books coming out for teens.